he Prime Minister, Shri Narendra Modi reviewing the activities of the Ministry of Culture, in New Delhi on April 24, 2015. The Minister of State for Culture (Independent Charge), Tourism (Independent Charge) and Civil Aviation, Dr. Mahesh Sharma, the Secretary, Ministry of Culture, Shri Ravindra Singh and other dignitaries are also seen. The Prime Minister, Shri Narendra Modi, today called for focused development of presentation material on how India has contributed to environment protection through the ages. Reviewing the activities of the Ministry of Culture, he asked the Ministry to take in lead in this initiative, which, if developed in time, could be presented during the upcoming United Nations Climate Change Conference – COP 21 – in Paris later this year. India must show the world how it has been at the forefront of environment protection. The Prime Minister asked the Ministry of Culture to focus in a big way on collecting and showcasing material based on specific themes. For instance, he suggested a focused effort related to different water storage and conservation practices through the ages, across India. Shri Narendra Modi was briefed on the capacity-building currently taking place in the museum sector. The Prime Minister urged the Ministry to work towards museum development, and high-quality 'virtual museum' development in a big way. In particular, the Prime Minister called for the creation of a world-class maritime museum at Lothal. The Prime Minister asked the Ministry to draw up a comprehensive set of skilled manpower requirements, and work towards meeting these needs in coordination with the Ministry of Skill Development. He said interpretation centres being set up by the Ministry at heritage sites and cities such as Varanasi, should also function as hubs which generate interest among children and youth, and catalyse the next generation of talent in various fields of music and culture. The Prime Minister also called for involving senior citizens in the process of showcasing cultural heritage to tourists. He suggested national televised "talent hunts" which could nurture the next generation of high-quality tourist guides for the top tourist destinations across the country. The Minister of State for Culture, Dr. Mahesh Sharma, and senior officers of the Ministry of Culture and PMO were present at the review. 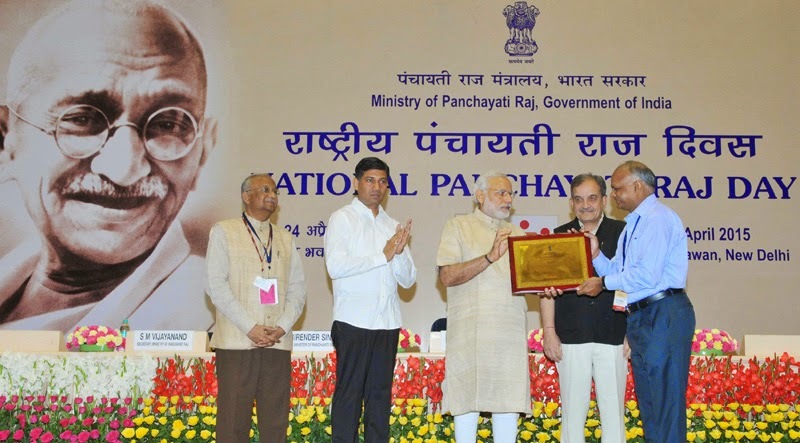 The Prime Minister, Shri Narendra Modi presented the State (Devolution Index) Awards and E-Panchayat Awards, at the National Panchayati Raj Day function, in New Delhi on April 24, 2015. The Union Minister for Rural Development, Panchayati Raj, Drinking Water and Sanitation, Shri Chaudhary Birender Singh, the Minister of State for Panchayati Raj, Shri Nihalchand and the Secretary, Ministry of Panchayati Raj, Shri S.M. Vijayanand are also seen. In his remarks at a function in New Delhi to mark National Panchayati Raj Day, the Prime Minister hailed the contribution of women in the functioning of Panchayats across the country, and called for an end to the practice of "husbands of female Sarpanches" – "Sarpanch Pati" - exercising undue influence. The Prime Minister urged Panchayat members to instil pride about the village. He said this required a firm resolve, rather than any budgetary provision. He gave some suggestions in this regard, such as celebrating a birthday of the village. He said issues such as education of children in the village, and vaccination for children, should be paid special attention to, by Panchayat members. The Prime Minister urged Panchayat members to motivate all Government officials in their village to spend at least one hour a week with schoolchildren of the village. The Prime Minister gave away the Annual Devolution Index (States) Awards, and E-Panchayat Awards, and congratulated the Zila Parishads and Gram Panchayats who were being felicitated on the occasion. The Union Minister for Panchayati Raj, Chaudhary Birender Singh, and the MoS Panchayati Raj Shri Nihal Chand were present on the occasion. A group of probationers of Indian Ordnance Factories Service (IOFS) of 2014 (I) batch called on the President of India, Shri Pranab Mukherjee today (April 24, 2015) at Rashtrapati Bhavan. Addressing the probationers, the President said that the Government service is still one of the most rewarding and satisfying experience for the people. The scope and breadth of exposure and responsibility that a career in Government offers, and that too at a relatively young age, is an experience and opportunity unlike any other. The President told the IOFS probationers that theirs was a stellar role in the defence of the country. The officers should always update themselves with new technology. Technological up-gradation is extremely important because for every failed weapon or ammunition, there is the life of soldier at stake who is performing his call of duty. Therefore, it is not only about producing arms & ammunition but about giving quality products. The probationers are presently undertaking training at National Academy of Defence Production, Nagpur and in Delhi to undergo training on Parliamentary Procedures and Practices at BPST, Lok Sabha Secretariat. The Vice President of India Shri M. Hamid Ansari released the “Delhi Policy Group – IDSA Report on West Asia” at a function here today. Addressing on the occasion, the Vice President said that this Report on West Asia is an excellent beginning but we have to go a way beyond this. We have very old social, economic, geographical, cultural and political relations with West Asian countries. One more thing should have been included in this Report as to why the West Asia is in its present situation. We have our interest in the stability in West Asia as we have our large workforce working in these countries. He hoped that this Report will be found useful by the strategic community. He congratulated Delhi Policy Group and the Institute for Defence Studies and Analyses (IDSA) for their valuable effort. The Delhi Policy Group and the Institute for Defence Studies and Analyses (IDSA) had set up a Joint Task Force on Indian Policy towards the ongoing transitions in West Asia last year. The Task Force Report has been edited by Ambassador Arundhati Ghose and has brought together eminent analysts such as Ambassador Ishrat Aziz, Pramit Pal Chaudharyu and Meena Singh Roy. It has argued that India needs to craft a “Look West Asia” policy to protect its many engagements in the region, from Energy to Indian Diaspora. The Vice President of India and Chairman, Rajya Sabha Shri M. Hamid Ansari inaugurated the ‘Swarn Jayanti Sadan Deluxe Flats for Members of Parliament of Rajya Sabha’ at a function organized by Rajya Sabha House Committee and Central Public Works Department here today. The Vice President visited the Flats and congratulated them for its timely completion. Located on Talkatora Road in Zone-D of the Master Plan 2021, these 14 flats are constructed by CPWD in a Ground + Seven story ‘Y’ shaped block. The cost of the project was Rs. 28.42 crores. The Government of India has approved and notified the Centrally Sponsored Scheme of National AYUSH Mission (NAM) on 29.09.2014, which inter alia includes the component of AYUSH Services, where there is provision for setting up of 50 bedded integrated AYUSH Hospitals for States/UTs in the country. AYUSH systems of medicines are used in maternal and child healthcare and the teaching hospitals of AYUSH systems have specialized departments for maternal and child health care. Central Council for Research in Homoeopathy (CCRH) is running specialty clinics for Mother and Child Health through its research centres and providing medical treatments. The National Rural Health Mission (NRHM) envisages mainstreaming of AYUSH by providing support for integrating AYUSH practitioners within the Primary health care delivery system through co-location and contractual appointment of AYUSH doctors/paramedics and also providing support for AYUSH drugs.